The image of Pinhead from the Hellraiser films is an iconic one, to say the least. 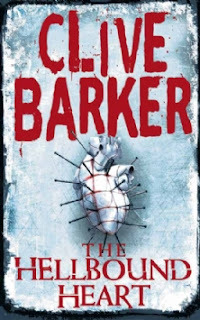 So, while I don't particularly have the temperament necessary to enjoy most horror films, when I found the book that the Hellraiser films were inspired by I couldn't pass up the opportunity of reading them. And was it worth it? Well there are certainly worse things to pass the time with. The Hellbound Heart is certainly a quick read, clocking in at only 128 pages. To be honest, that's all that the story really warrants, considering the simplicity of the material. The gist of the story is that a man named Frank discovers the solution to a puzzle-box that is rumoured to grant whoever solves it with pleasure beyond their wildest imaginings. What happens instead is that he is pulled into a parallel world by creatures called Cenobites, who provide him with moments of great pleasure amongst moments of torture and pain. The other main character of the story is Julia, Frank's sister-in-law, as she finds what is left of Frank and attempts to bring him back to the real world through the gift of blood. It's a short, but creepy little book. To be honest, there's not much to really add other than a quick summation of the plot. The characters aren't especially sympathetic, but then part of the fun is watching their selfishness and arrogance bring their doom upon them. It's not fantastic, but it does it's job quite well, bringing entertainment and visceral gore by the bucket-load along with some pretty nifty suspense. Perfect for a horror film then. Next review: Pamela by Samuel Richardson.